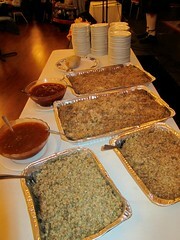 Gung Haggis Fat Choy Seattle V was amazing! The Seattle version of Gung Haggis Fat Choy Robbie Burns Chinese New Year Dinner has an edgy feel, which pushes the boundaries of both traditional Robbie Burns and Chinese New Year dinners. 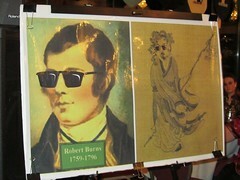 Scotland's favorite son Robbie Burns is compared to China's most famous poet Lao Tzu. 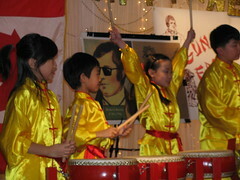 Children of all ages enjoy this multicultural, intercultural event, which has featured the Washington Chinese Youth Ensemble in past years, and was a fundraiser this year for the North West Junior Pipe Band. 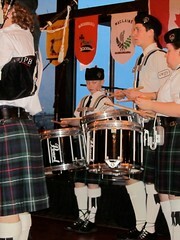 A young drummer keeps up with the older drummers around him. 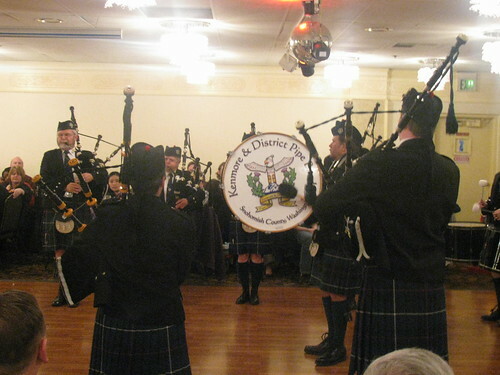 This cultural fusion event opened with the North West Junior Pipe Band. Pipe Major gives signals to the band, and demonstrates good poise. 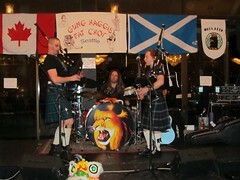 The band is a mix of male and female, older and younger, and often comes up to Vancouver area, to compete at the BC Highland Games in Coquitlam. 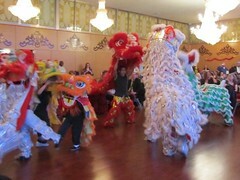 The dance floor was soon invaded by 6 Chinese lions – two were lion cubs. 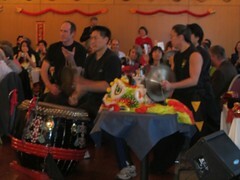 Bell Town Martial Arts is led by Sifu David Leung, who once studied with Bruce Lee. was used for my Address To The Haggis. 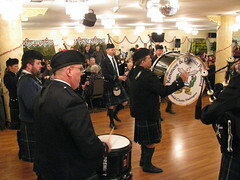 Jamie Foster sings the Burns song, “Ae Fond Kiss”, then helped lead a singalong of Loch Lomand, with musicians Todd Wong on accordion, Red McWilliams on guitar and Susan Burke on fiddle. 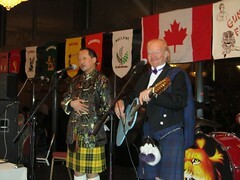 Todd Wong and Red McWilliams, hosting and singing + comic relief. 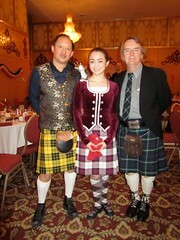 We led an interesting diversion of kilt tartan identification. 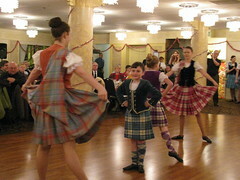 Lauren Black, premier Highland Dancer, from Toronto. What was she doing in Seattle? 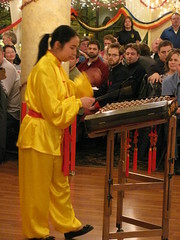 She specifically came out to perform at the Seattle Gung Haggis Fat Choy Dinner because her mother is 2nd generation Chinese-Canadian, and her Scottish-Canadian father plays bagpipes, and it was a good excuse to come visit relatives. 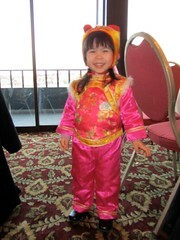 Last year she found out some of her friends, who live in Seattle had danced, and she decided she wanted to, too! 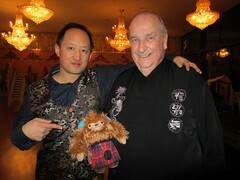 Todd Wong presents a kilt wearing Quatchi to Gung Haggis Seattle organizer Bill McFadden. 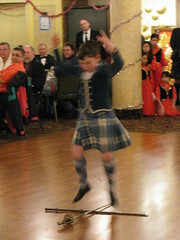 This entry was posted in Asian Canadian Cultural Events, Cultural Fusion, Food & Restaurants, Gung Haggis Fat Choy dinner, Kilts - wearing kilts, Main Page, Multicultural events, Robert Burns & Burns poetry, Scottish, Gaelic, Irish Celtic events and stories, Seattle Gung Haggis Fat Choy, Todd Wong, Vancouver Area Adventures on February 23, 2011 by Todd. and Auld Lang Syne sung in both Mandarin Chinese and English. 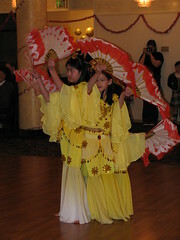 This entry was posted in Asian Canadian Cultural Events, Food & Restaurants, Gung Haggis Fat Choy dinner, Main Page, Multicultural events, Robbie Burns Day, Robert Burns & Burns poetry, Scottish, Gaelic, Irish Celtic events and stories, Seattle Gung Haggis Fat Choy on February 21, 2010 by Todd. North Seattle Herald-Outlook has written a story about the upcoming 2nd coming of Toddish McWong to Seattle. 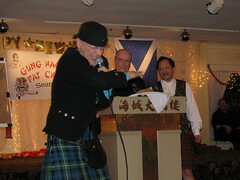 Last year we staged a Gung Haggis Fat Choy Robbie Burns Chinese New Year Dinner on Chinese New Year Day in Seattle. 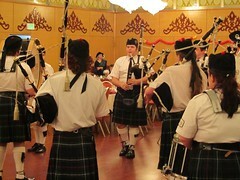 It was a benefit for the Pacific North West Junior Pipe Band. of Seattle on Feb. 24. And if you're thinking to yourself, 'That sounds like a bizarre combination,' you're not alone. Vancouver, B.C., entering its 10th year. experiment has gained some acceptance. The festivals are held around the world, but the haggis-dim sum derivation is McWong's particular hybrid. the nicer things it's been called. So “Hei” was replaced with “Haggis,” and Gung Haggis Fat Choy came into being. 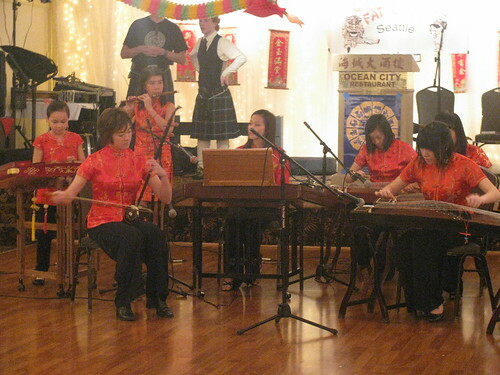 “I think the Scottish people come to eat the Chinese food, and the Chinese people come for the bagpipes,” Wong said. 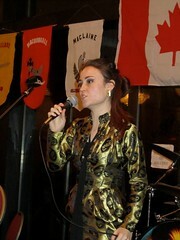 McFadden's, president of the local Caledonian Society in 2007. Scots to each Chinese person in attendance in Vancouver. Sunday, Feb. 24, 5-9 p.m. 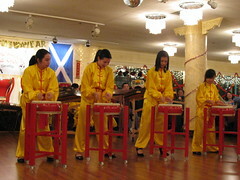 This entry was posted in Gung Haggis Fat Choy dinner, Main Page, Seattle Gung Haggis Fat Choy on February 16, 2008 by Todd.